This utility works on Windows Vista/7/8/2008/10 32-bit or 64-bit. Older versions of Windows are not supported. The connection name is now displayed in the adapters list of 'Advanced Options' window. Fixed WirelessConnectionInfo to work properly when a USB wifi card is plugged while it's already running. 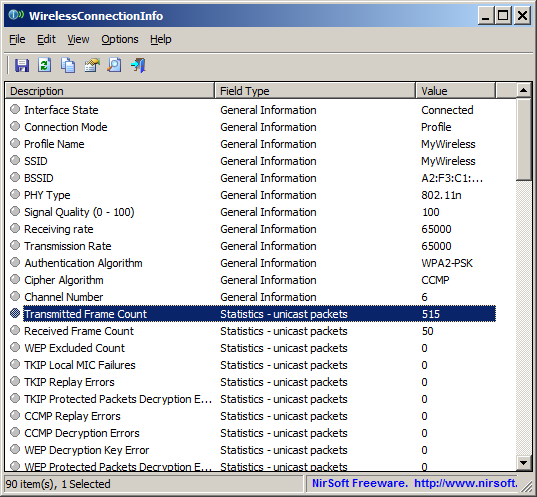 After running it, the main window displays general information and statistics about your current wireless network connection. If WirelessConnectionInfo fails to detect your wireless connection, you should press F9, and choose the correct network adapter. /stext <Filename> Save the wireless connection information into a regular text file. /stab <Filename> Save the wireless connection information into a tab-delimited text file. /scomma <Filename> Save the wireless connection information into a comma-delimited text file (csv). /stabular <Filename> Save the wireless connection information into a tabular text file. /shtml <Filename> Save the wireless connection information into HTML file (Horizontal). /sverhtml <Filename> Save the wireless connection information into HTML file (Vertical). /sxml <Filename> Save the wireless connection information into XML file. A file named WirelessConnectionInfo_lng.ini will be created in the folder of WirelessConnectionInfo utility. After you finish the translation, Run WirelessConnectionInfo, and all translated strings will be loaded from the language file. If you want to run WirelessConnectionInfo without the translation, simply rename the language file, or move it to another folder. WirelessConnectionInfo is also available in other languages. In order to change the language of WirelessConnectionInfo, download the appropriate language zip file, extract the 'wirelessconnectioninfo_lng.ini', and put it in the same folder that you Installed WirelessConnectionInfo utility.